This attitude (and arrangement) ended when my son hit 6 years old and my daughter 10 years old. By then, their protests of us going to Hawaii without them had grown quite loud and had worn us down. We ended up taking them to Maui during their Spring break from school that year and it was the best family vacation we have ever had. Not only that but we have never looked back. 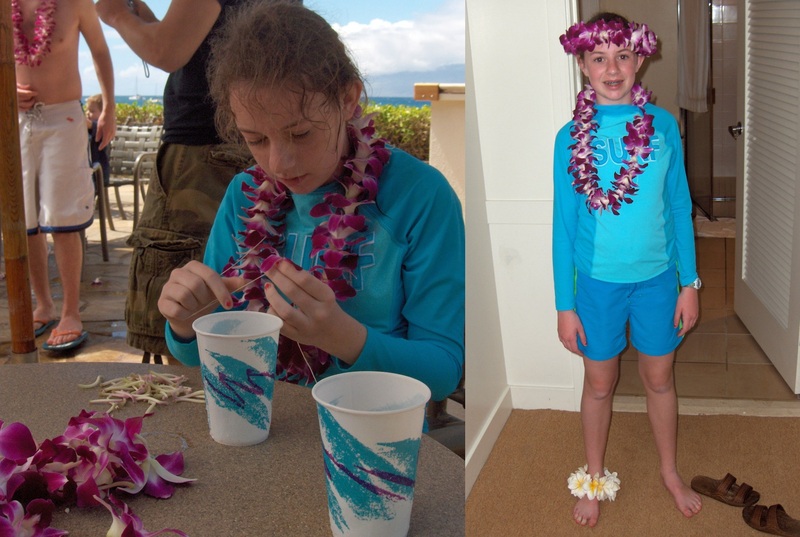 Now, we don’t think of going to Hawaii without our kids. In some ways they appreciate the Islands more than we do. For instance, my son can boogie board literally all day long. Long after the rest of us have dragged our beaten bodies back to the shore to lay around in the sun for the rest of the day. Hard wipe-outs do nothing to dampen his enthusiasm. In fact, if I have captured them on photo, images of these spectacular crashes will egg him on. 1) The kids were old enough to appreciate it. A number of years earlier, we had taken the kids to southern California on a event packed family vacation. We visited Disneyland, SeaWorld, and a number of famous sites around San Diego. When we got back home after our non-stop adventure, I asked the kids, “What was the best part of the vacation?”. They shouted their answer back in unison, “swimming in the pool at the motel.” WHAAAAA? When I probed them deeper bringing up all the other more expensive stuff that we had done, they responded that “all that other stuff was okay, too”. I am glad I hadn’t paid close to $1,000 a ticket to fly them somewhere to get the “okay too” response. 2) There was a built up anticipation. Over the years, as my kids got older and we left them behind venturing off into our tropical retreat, the kids questioned why they couldn’t come. By the time we did actually include them, they were bursting at the seams with pent up expectation. They had watched for years as we shared our pictures of wonderful outings with others and wanted a piece of that action for themselves. One a personal note, I wouldn’t suggest that you torture your kids quite like we did. Looking back, I would probably have taken them with us a few years sooner. 3) We are a beach loving family. Plain and simple, my family loves the beach. We love to lay on the beach in the sun (with sunscreen) reading books and sleeping. We love to swim in the awesome ocean. We love the sound of the crashing waves. We love the smell of the ocean and sunscreen all around us. We love to watch the surfers farther out. We love to watch other families playing in the ocean, all smiles and giggles. We have taken vacations that don’t include an ocean and frankly, for our family, they just don’t match up. We love the palm trees, walking barefoot in the sand. We love to eat fresh pineapple and coconut. We love how the humidity softens our skin and curls our hair. There is a totally immersive, therapeutic value of laying on a beach long enough for all the cares of the world to dissolve and I haven’t found any other venue where that happens quite so quickly. 4) We are also an animal loving family. My daughter is now studying for an animal science degree (changed from her original plan of being a marine biologist). As a family, we have volunteered for years at our local humane society. We have owned our own share of pets–capping out at two dogs, two fish and a brief stint with a chinchilla. In Hawaii, we love to swim with the sea turtles and watch the beached seals and watch the sand crabs scurry across the sand. We have also watched the dolphins frolic in La Perouse bay, Hulopo’e Bay (over at Lanai), and along side us on many boat excursions. 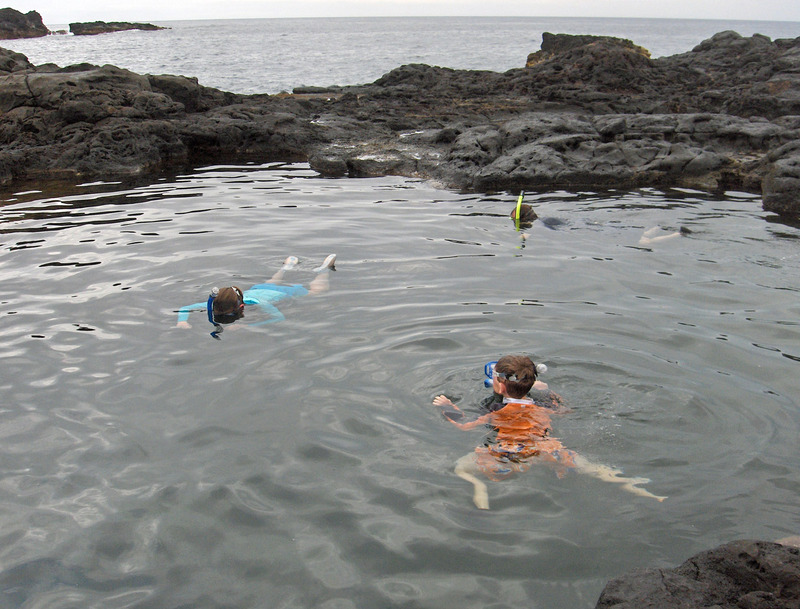 We love to watch the colorful fish as we snorkel. And of course, the Maui Ocean Center is always a big hit. 5) The kids programs seemed to be custom made for my family that vacation. We stayed at the Black Rock Sheraton and their classes where perfect for my family. My daughter is crafty and got to make lies. 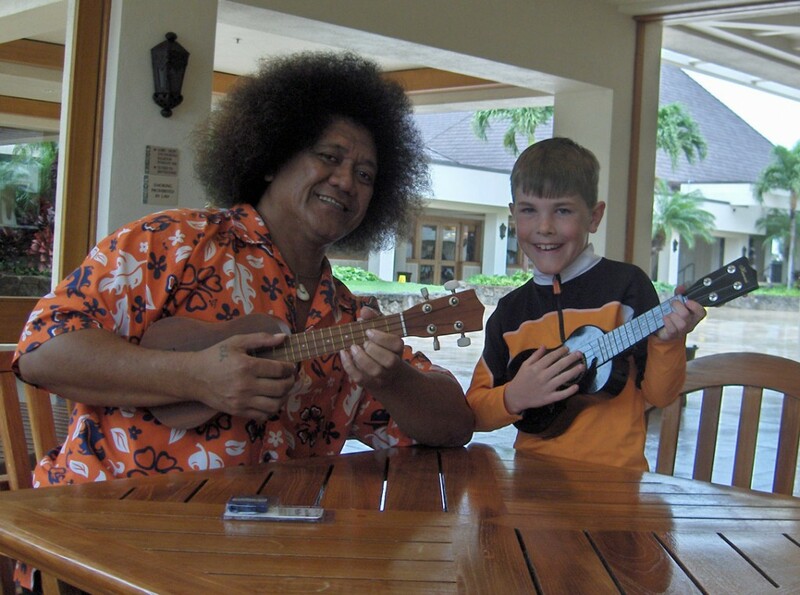 My son is musical and got ukulele lessons. 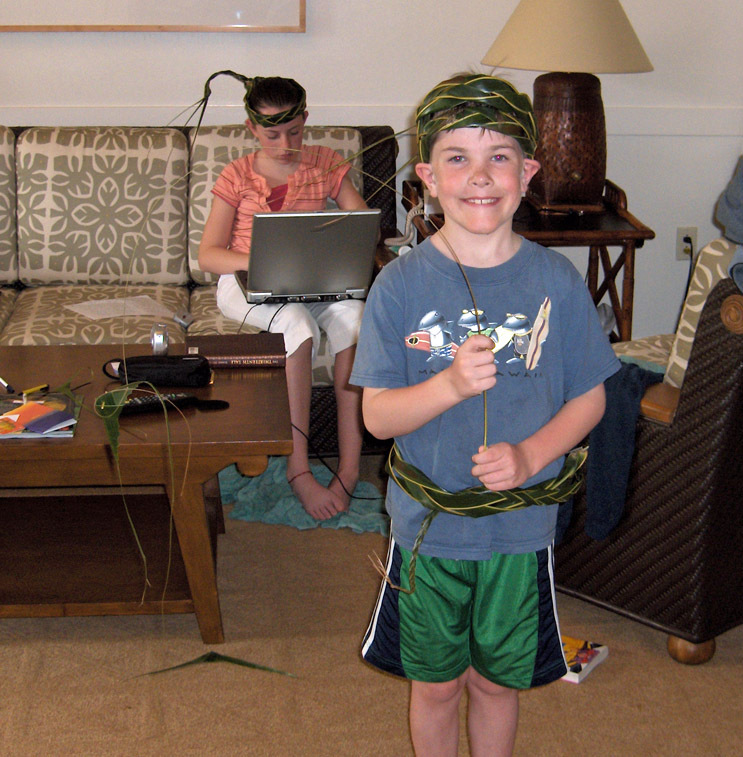 They both made all kinds of things out of palm fronds. 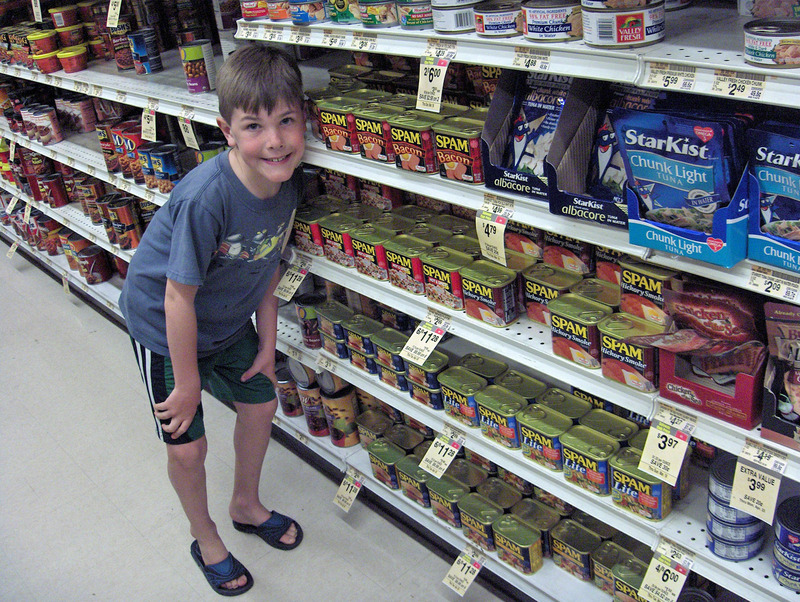 6) We let the kids take a big part in planning that vacation. We laid out our options and what we saw as the pros and cons of each option and let the kids choose. On a couple of days when the weather warranted a change in plans, we let the kids decide what we were going to do. 7) There were a lot of “firsts” on that vacation. There is a certain excitement that comes from experiencing certain things for the first time. 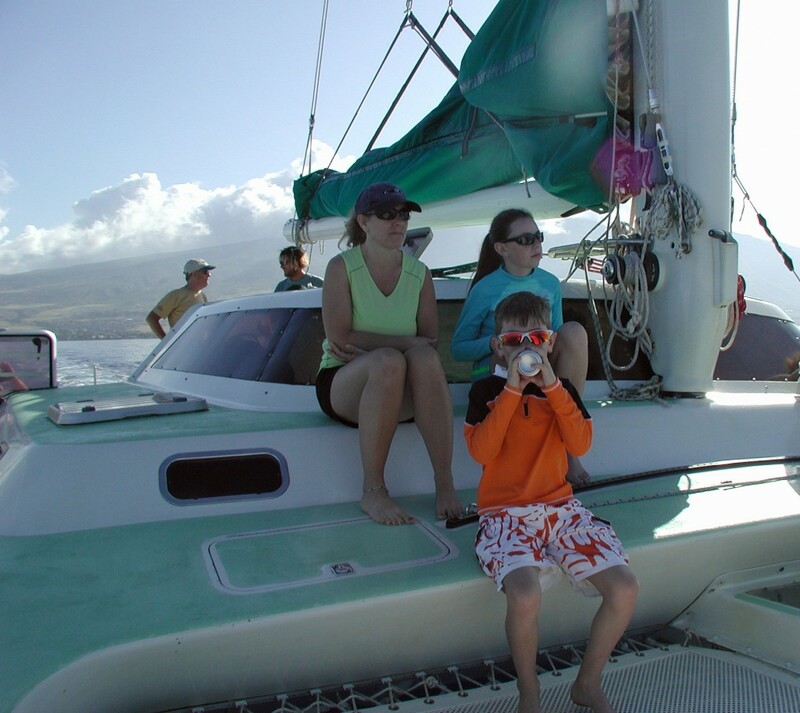 It was the first time the kids had flown over an ocean, been to Hawaii, visited a volcano, saw a live whale in the wild, snorkeled, or been on a catamaran. The kids got to eat their first shave ice, spam, and Roy’s souffle. It was the first time they drank coconut water out of a coconut or POG (out of the carton). 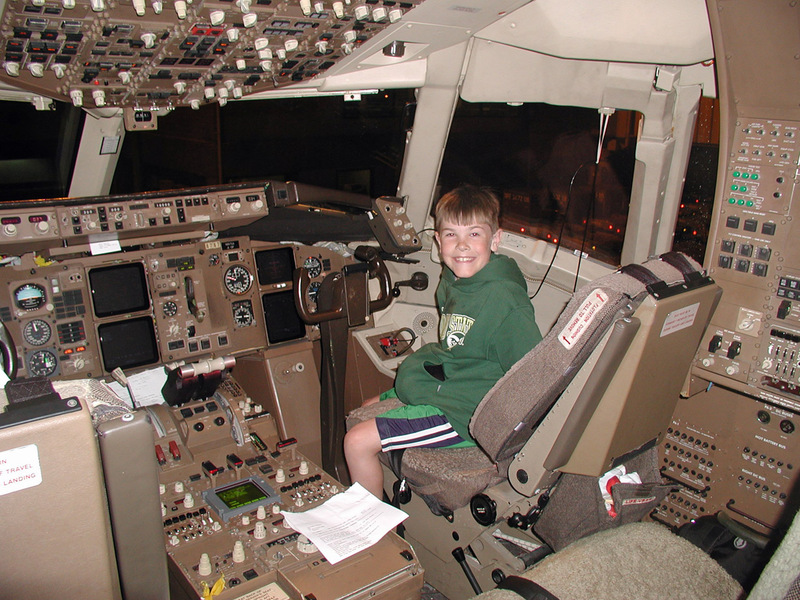 It was the first time my son got a chance to sit in the cockpit of a 747. 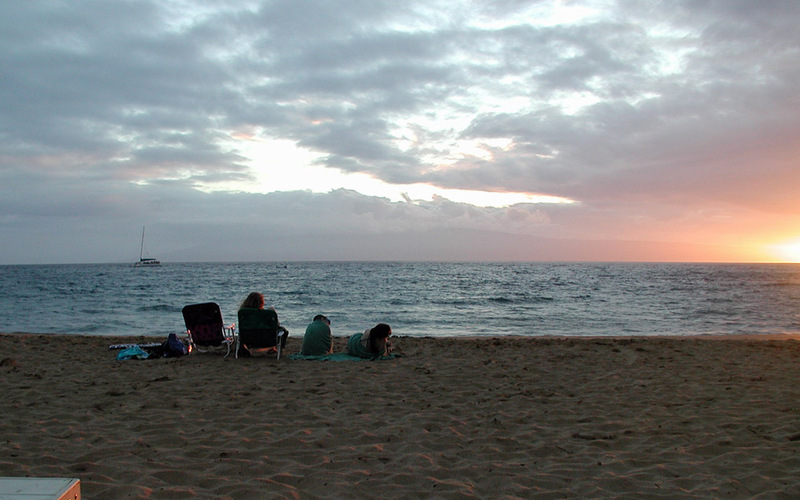 It was the first time that either kid got to see one of those spectacular Hawaiian sunsets or shop at a Hilo Hattie. There were just too many firsts to list them all. Unfortunately, barring a serous head injury, there really isn’t any easy way to recreate a first time. We have had other awesome Hawaii vacations. 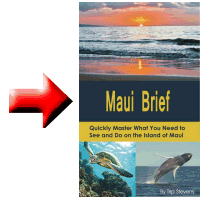 While they have been great outings, that first Maui vacation has been held up for years as our golden standard as the vacation to beat.